Fight the enemy in their bases and stop the spread of Krystal Yayo drug which is turning people into zombie-like creatures. KickAss Commandos is an action-packed top-down retro shooter that lets you play as a commando on a mission to save the world using all kinds of fire power. Handle machine-guns, flamethrowers, rocket launchers and grenades as you fight the good fight and slay all enemies. Enter the battlefield to rescue your comrades, wipe out all of the enemy's production of Krystal Yayo,and save humanity. Missions span deadly jungles, frozen arctic tundra, and scorching desert wastelands. 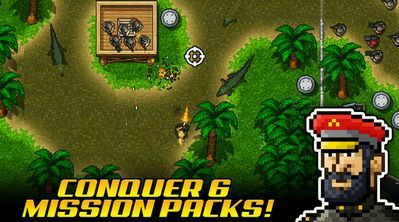 As you progress, you'll rescue and unlock commandos to join your units and grow in power. You can upgrade and customize them as you wish for your next missions. 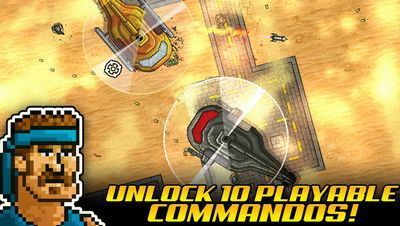 Destroy tanks, sniper towers, gunboats, and attack helicopters, etc in this ultimate war. And try your best to kill all bosses such as The Rocket Brothers, Killer Yeti Warriors, genetically engineered Alligators, and Corpus Natas.